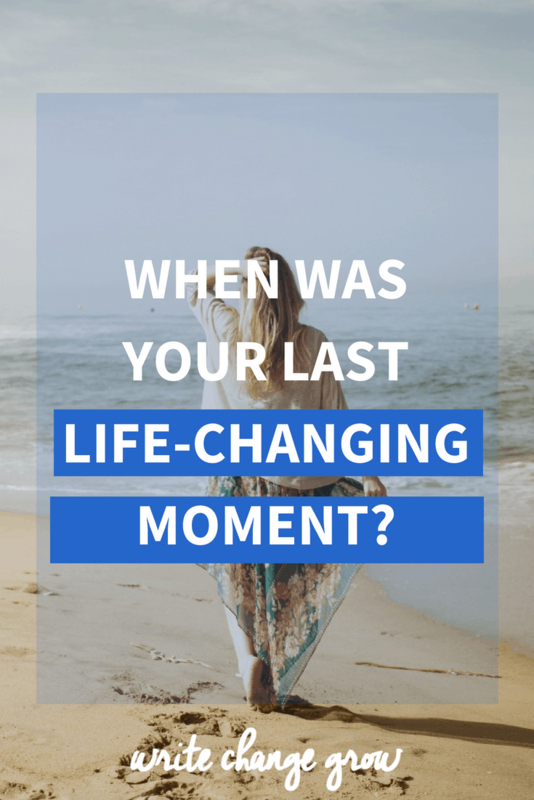 When Was Your Last Life-Changing Moment? When Was Your Last Life Changing Moment? We all have moments in life that change us forever. Sometimes we instigate these moments ourselves, while others are thrust upon us. Sometimes it may take time to realize just how much one moment has affected our lives and changed its trajectory. On occasion we don’t comprehend we are changing our lives – we view it as embarking on an adventure. Of course, life-changing moments came in all shapes and sizes. Some we pray we never have. Some are tragic, sad and totally out of our control. Disclosure – This post contains affiliate links and I will be compensated in you make a purchase after clicking on my links. Any compensation I receive does not affect the price you pay. To work out when your last life-changing moment was, it helps to be able to define what a life-changing moment means to you. To start the ball rolling I thought I would make a list of my own pivotal moments. I recommend you write up your own list as well. Clearly, some of those moments were tragic. Losing my Dad had a huge impact on my life. It was one of the worst times of my life. Yet, there have been many, many joyful events as well. There have been exciting adventures and acts of bravery and craziness. I’m sure it is no coincidence that several of my life changing moments have involved an airport. Travel has changed my life in amazing ways. There have been times when something bad, like being made redundant for example, has turned into a positive. The truth is some of the moments we consider awful at the time are often blessings in disguise. For this post, I want to focus on the positive life-changing moments in our lives. To the ones we wholeheartedly want to embrace. So when was the last time you had a positive life-changing moment? Come on now, think hard. If one or two popped into your head straight away, then bravo! Maybe you are drawing a blank. Perhaps your last moment was too long ago. Perhaps your life has been ambling along at the same steady pace. Nothing much happens. Nothing much changes. No ups and downs, just more of the same. Perhaps you like it that way. But what if you don’t? What if you are bored out of your brain? What if you are wondering, what the hell happened to my life? If that is the case, it’s time to do something bold and adventurous. Something wild and crazy. Let’s be clear here, wild and crazy doesn’t mean doing something stupid, like say running off and leaving your wife/husband and family. It doesn’t mean having an affair or an inappropriate relationship. That sort of behavior causes a lot of damage and creates drama and stress in your life, not excitement and adventure. Don’t confuse creating drama with being bold. Unfortunately, I made this mistake myself when I was younger, creating drama when there wasn’t any when there didn’t need to be any. I hate to admit this but I created drama in my life simply because I was bored. Because I felt lost. I was literally looking for love and excitement in all the wrong places because I knew something was missing in my life. Instead of seeking out drama, I should have done something creative or helped other people, which is what I was really craving. In the above list, many of the positive changes (particularly near the lower end of the list which are the most recent) were instigated by me. I chose them. I fought for them. As far as the stuff on the list that was devastating and painful. The stuff that rocked me to my core. I fought hard to pick myself back up and move forward there as well. I reiterate moments come in all shapes and sizes. It’s not just about shaking up or changing your life either. What about changing someone else’s life for the better? What can you do to help other people? I was originally going to write a list with this post about how you can create life-changing moments. But I doubt you need to read that list. Deep down you probably know what you need for your next life-changing event. You need the courage to take the first step and the willpower, determination, and perseverance to see it through. If the thought of change scares you look at it a different way. Think of it as expanding life, improving life, celebrating life. You KNOW what to do. It’s buried deep inside of you where you left it sleeping. It’s time to wake up. When was your last positive life-changing moment? My worst one by far Thea was when I lost my Dad too. It wasn’t the thought of him dying but the way he left this world. Long story and not a pleasant one. The most positive life changing moment for me was actually when I was let go from my corporate job back in early 2007. I actually manifested that scenario if you must know the truth and decided to change the direction of my life and manifest something entirely different and new to me. The journey has been up and down for sure but it’s been the best experience for me really getting to learn a lot more about myself which overall has turned into a very positive experience. Thanks for sharing all your moments with us and you’ve definitely had some moments. I’m not about to list all of mine. Why? I’m much older than you and have had way too many! So wonderful to see you here again. Thank you so much for your comment. I am really sorry to hear about your Dad. I had no idea until it happened how hard losing a parent could be. That is fantastic to hear your most positive moment was leaving corporate life. To be honest, I am hoping my pivotal moment will be leaving corporate life as well. I am in the starting out and sometimes struggling stage, which while I appreciate is an important part of the learning process, I am also secretly hoping it doesn’t last too long! As you mentioned though the journey has its ups and downs. It wasn’t till I read back through my list after writing the post that I realised I don’t have some of the ‘conventional’ items a lot of people have on their list at my age like getting married and having kids for instance. I guess I have always done things a little bit differently or on a totally different time frame to other people. It has taken me a while but I am learning to embrace that and not be ashamed or worried about it. Thank you again for stopping by. It is always wonderful to talk to you. A lovely article Thea and a lovely trip down memory lane as I considered all the crazy, exciting, momentous, and sometimes very quiet moments in my life that have shaped the person I am today. What’s most interesting about this exercise is that for every life-changing moment I have had, it’s been due to another life-changing moment before that. Some were horrendous at the time.. but the path they set me on has led to a very happy place, so I’m grateful for the good and the bad alike. Some of the most recent positive life-changing moments for me were receiving my new heart valve in 2008 (I was able to live my life to its fullest again! YAY! ), going back to work only to be inspired to start my own business, and meeting an amazing person at that previous job who has provided me some incredible opportunities for my business in the most unexpected ways. I can’t wait for the next opportunity that comes knocking on my door! Lovely to see you here. Thank you so much for commenting. I am so glad you enjoyed the article. I loved the fact you mentioned the ‘very quiet moments’ because they can definitely shape our lives. Sometimes the big game changes are the quiet moments. I hear you on the good and bad alike aspect. Sometimes I have regrets over a certain event than I realise I wouldn’t have what I do right now if that had not happened and that turns my thoughts to a better more positive place. WOW that blew me away when you talked about receiving a new heart valve. That is truly life changing!!! I am so glad to hear it all went well and lead you in some wonderful new directions in life. Very powerful. I like your ‘why not’ philosophy. Many people are too busy thinking ‘why?’ or ‘why bother?’ to jump at opportunities or change. I look forward to hearing about your next fab opportunity when it comes knocking!!!!! Again lovely to have you here Anna and I look forward to chatting again soon.